The Sunflower Galaxy, also known as Messier 63 (M63), is a bright spiral galaxy located in the constellation Canes Venatici. The galaxy lies at a distance of 37 million light years from Earth and has an apparent magnitude of 9.3. It has the designation NGC 5055 in the New General Catalogue. Messier 63 is a member of the M51 Group, a group of galaxies in Canes Venatici that also includes the famous Whirlpool Galaxy, also known as Messier 51. M51 is the brightest galaxy in the group and M63 is a prominent member. The Sunflower Galaxy is known for its bright yellow central region and sweeping spiral arms interspersed with active star forming regions and dark dust lanes. The galaxy is enormous in size, spanning roughly 130,000 light years across, an area roughly equal to the size of the Milky Way Galaxy. It is home to more than 400 billion stars. Observations in infrared wavelengths revealed that the galaxy has a two-armed spiral structure. In the inner region of Messier 63, the spiral arms are tightly wound around the core, and they are less tightly wound in the outer regions. M63 is home to many bright starburst regions, extended emission nebulae found within the spiral arms in the outer region. The arms appear discontinuous and patchy, and the galaxy appears to have a large number of them, which makes M63 a prototype for a class of spiral galaxies called flocculent spirals. About 30 percent of known spiral galaxies are flocculent. Only 10 percent are grand design spirals, and the remaining majority are multi-armed. The best time to observe the Sunflower Galaxy from northern latitudes is in March, April, and May. 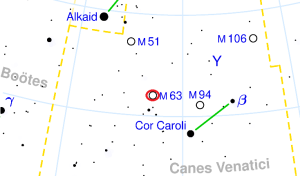 Even though the constellation Canes Venatici is a relatively faint one, M63 is not difficult to find. It can be located using the stars of the nearby Big Dipper. The galaxy lies about two thirds of the way from Alkaid, the star marking the tip of the Dipper’s handle, to Cor Caroli, the brightest star in Canes Venatici. M63 lies some 14 degrees to the southwest of Alkaid. 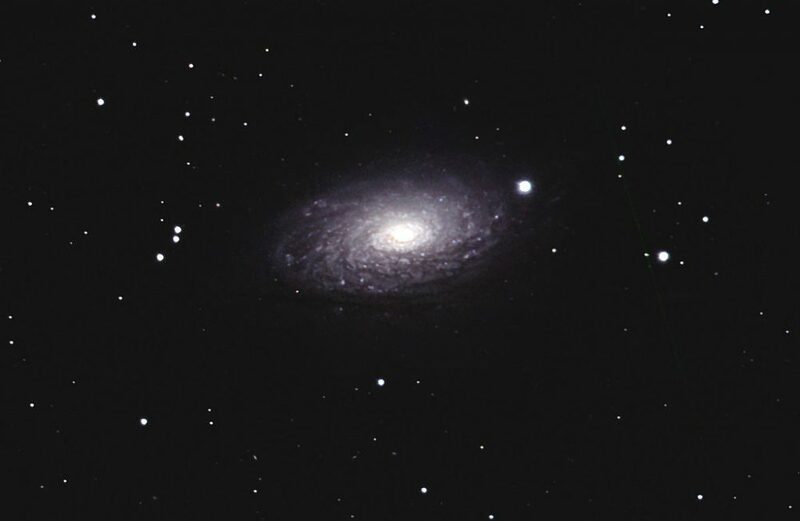 The Sunflower Galaxy is not an easy object to view in binoculars. In a 3.1-inch refractor, it can be identified as a galaxy, but the details and spiral arms aren’t visible. A 6-inch telescope reveals the galaxy’s bright core and an oval patch of nebulosity around it. The spiral structure is only visible in 8-inch telescopes or larger instruments. The Sunflower Galaxy was discovered by Pierre Méchain, Charles Messier’s friend and colleague, on June 14, 1779. The galaxy’s was Méchain’s first discovery. Lord Rosse observed the spiral structures of M63 in the mid-19th century. The Sunflower Galaxy was one of the first galaxies in which such structures were observed. Lord Rosse listed the object as one of the 14 “spiral nebulae” discovered until 1850. The Sunflower Galaxy was resolved by William Herschel and later catalogued by his son John. A Type Ia supernova, SN 1971I, triggered by a violent explosion of a white dwarf, was detected in the galaxy on May 25, 1971. It was observed in one of M63’s spiral arms and reached a peak magnitude of 11.8. 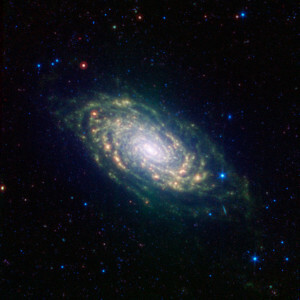 The Sunflower Galaxy has extended features that may have formed as a result of interactions with neighbouring galaxies. The extended structure stretches far beyond the bright extent of the galaxy’s normal spiral arms and more than doubles M63’s true extent. In 1979, a faint feature resembling a giant arc-loop was detected in the galaxy’s halo, but it was unclear whether or not the feature was physically associated with the galaxy. A recent study confirmed that it was, and that it was likely the result of a merger with a much smaller dwarf satellite galaxy. The loop is thought to be the stellar stream of the smaller galaxy, accreted at some point over the last 5 billion years. 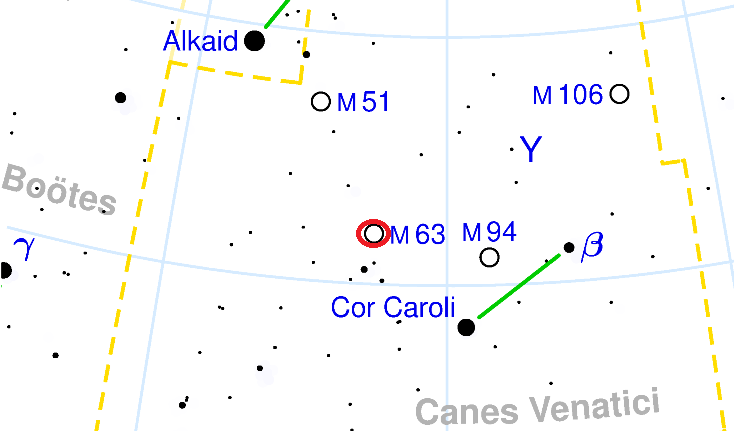 The structure extends 14.0′ and can be seen around the disk of M63. The galaxy’s warped disk shows evidence of the merger. The Sunflower Galaxy is believed to have a supermassive black hole with a mass of up to 30 million Suns. The galaxy’s outer regions are rotating at such a speed that, without dark matter, the galaxy would rip itself apart. The Sunflower Galaxy is one of the four Messier galaxies in Canes Venatici constellation, along with the Whirlpool Galaxy (Messier 51), Messier 94, and Messier 106. It is only slightly fainter than the grand design spiral M51. The Sunflower is gravitationally bound to the Whirlpool Galaxy and, together with at least six smaller galaxies, they form the M51 group.